I actually stumbled onto this recipe on my own a few years ago when I was trying to perfect my pumpkin pie filling. Somehow I ended up with filling leftover and I decided to mix up the remaining filling with some flour, pop it in the oven, and see what happened. 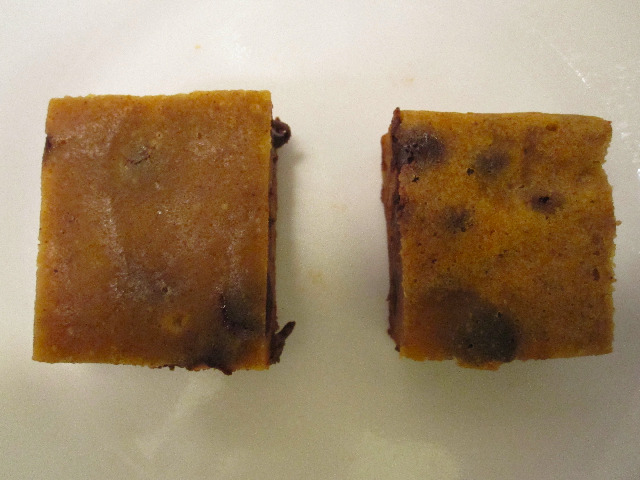 The result was nearly identical to these "brownies." Those quotation marks are significant because although I'm not sure where I stand with these (good, bad, indifferent), they're really not brownies. The texture of a brownie just isn't there. Texturally if you can imagine a more solidified pumpkin pie filling that's what these are. I even received a comment that if I hadn't mentioned "brownie" they would have just thought it was pie filling. Though, this doesn't mean they were bad, necessarily. Perhaps it was my alterations that lead to this, but I'm not so convinced. I wanted to use pumpkin that was left over in the fridge from Thanksgiving and the idea of a pumpkin brownie was too hard to pass up. But because I was just coming off of Thanksgiving and the mass quantity of eating that I had done, I wanted something a little lighter. So along side my standard reduction of sugar, I also replaced the butter with applesauce (okay this is only a partial truth, I don't own a microwave yet, and melting butter on the stove was too much work). It was a bit of a gamble, but I figured at worst I was wasting pumpkin that I would have otherwise thrown out. I also lessened the amount of pumpkin pie spice because I typically feel that pumpkin desserts are generally over spiced. Oh yeah, and because I wanted low-fat, I obviously reached for the chocolate chips. That makes sense :). Skip ahead to the eating because there really is nothing involved in baking these. For some reason I was in a rush or agitated or something, but my first taste was a little too early. 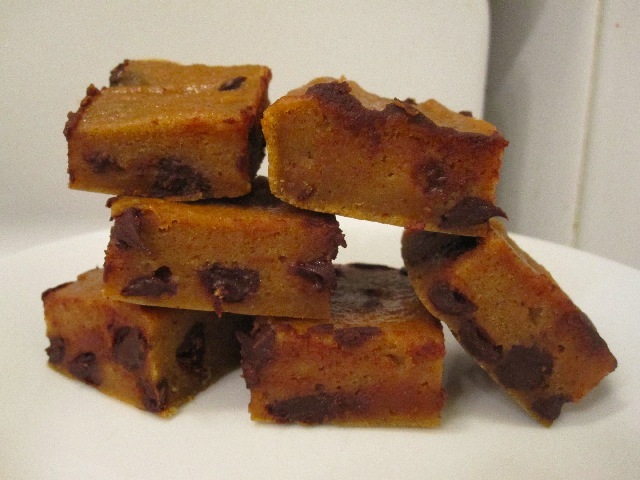 At this point the chocolate chips had yet to cool and were still quite melty. As a result, all I could taste was chocolate. My second taste came a few hours later when I shared them with my parents. The brownies were now completely cooled but I could tell my mother really didn't like them much. Her only comment was "that is a lot of chocolate" and it didn't seem like she was going to have seconds. I liked it a little better now that it was cooled, but not a lot. I definitely regretted the chocolate chips or at least the amount, oh, and the texture was strange. That was all until the next day when I started to like them more and more, actually ending up eating quite a few. When I mentioned them to my father again, he said "Oh yeah, those were good" and he doesn't comment on things often. It seemed that the next day the flavour of the pumpkin and spices were much more full, and the chocolate not as overpowering, though the texture was still a little jarring. And even though I liked them more, I'm not exactly sure how much. There was one strange thing I noticed. It seemed like the applesauce kind of pooled in the center of the brownies, leading to a texture and colour variation between the outer edges and the center (which you can see in the image above). The lighter pieces had more of a brownie texture, but the darker ones more gelatin and you could actually taste the applesauce. It was kind of weird, but not bad, just a little shocking to have a sour apple flavour in the middle of your chocolate pumpkin dessert. So that's where I am with these. No where. Was it the applesauce that caused them to be un-brownie like? Maybe, but I don't think so. Would I make them again? Perhaps if I was really struggling to use up some leftover pumpkin though I can't necessarily say I would do it otherwise. And then again there's part of me that really enjoyed the chocolate, pumpkin combination and even the texture. That part of me is convinced I could eat an entire batch. I'm not sure what to tell you. I keep looking at my shoulders for some guidance, good or bad, but I think even they might be confused. Granted, the red dude usually wins :). Preheat oven to 350F and line an 8x8 pan with foil and lightly grease. In a large bowl add applesauce and both sugars and stir until completely combined. Add egg and stir until combined. Stir in pumpkin until combined and smooth. Stir in vanilla. Add pumpkin pie spice and salt and stir until combined. Add flour and stir until just combined and no streaks of flour remain. Pour batter into prepared pan and bake for 20 to 25 minutes or until tooth pick comes out clean (mine took 24). Allow to cool completely in pan on rack before slicing and serving. I've often thought of using a bit of pumpkin butter to intensify the flavor in pumpkin sweets as well. Once again, I really enjoy these 'works in progress' posts--I think that, although it's very commonly seen, the chocolate-pumpkin combo is a very difficult flavor balance to get, because both are so intense on their own. Yeah, it actually occurred to me afterwards that I could have just used more pumpkin. Had I thought about it at the time I probably would have done that (though maybe I didn't because I didn't have anymore, it was a few weeks ago now). If you think about it, the first time I did "this" recipe was with pumpkin pie filling and there was no butter/applesauce, and it turned out nearly identical (if my memory can be trusted). And thanks, I pretty much consider everything a work in progress, except for a few :) and I post everything I bake, because I don't bake a lot. To me chocolate and pumpkin is almost the dessert version of prosciutto et melon (Italian appetizer of prosciutto wrapped cantaloupe). Definitely an acquired taste and not for everyone.